Arrival in Hanoi, capital of Vietnam, transfer to the hotel. Walking around the downtown of this stylish and gracious city that retains an unique old world charm and some of Asia’s most striking colonial architecture with many peaceful lakes and parks, tree-lined boulevards and traditional temples. Explore this one thousand year old capital city with the mausoleum of the nation’s founder Ho Chi Minh (close on Monday & Friday), the Presidential Palace, the Ho Chi Minh’s house on stilts, the One Pillar Pagoda, the Temple of Literature, the Museum of the Ethnology, the West Lake, Tran Vu Pagoda, the Lake of the Restored Sword and Ngoc Son Temple. Late afternoon we take a cyclo ride through the bustling old quarter streets. Evening enjoy a fantastic traditional water puppet show (unique to Vietnam). Morning drive through the Red River delta to Halong Bay (165 km), a World Natural Heritage Site, view the rural scenery en route. Upon arrival, we board a traditional wooden junk for a cruise through the spectacle of the nature – Ha Long Bay, the Vietnam’s most scenic site. Explore its natural beauty and cave. If weather permit, we can dive off the boat and have a pleasant swimming in the deep blue water of South China Sea. Continue our cruise exploring the natural beauty of the World Heritage visiting Dinh Huong island, Ga Choi island, Dog island, Sail island, the cave of Surprise, one of the biggest and the most beautiful cave in Ha Long beautifully decorated by thousand of stalactites and stalagmites. Afternoon drive back to Hanoi. Stop en route to visit Dong Trieu ceramic village. Late afternoon, transfer to the Hanoi Railway Station to take an overnight train to Hue, the last imperial capital of Vietnam, the World Cultural Heritage Site, well-known for magnificent architecture, pagodas and royal tombs laid in small villages and surrounding hills. Morning arrive in Hue. A boat cruise on the romantic Perfume River takes us to the Hue’s oldest and most revered site, Thien Mu Pagoda, an unofficial symbol of Hue. Afternoon visit the Imperial Citadel, the Pupple Forbidden City, the elaborate tomb of Emperor Tu Duc and the famous Tu Hieu Pagoda. We drive to Hoi An (136 km), a World Cultural Heritage. Stop en route visiting Cham museum which contains the finest collection of Cham sculpture in the world, the beautiful Marble Mountains and the famous China Beach. Upon arrival in Hoi An, wander its peaceful narrow streets to see many centuries-old architectures combining influences of many exotic trading community, visit the 200 year-old Tan Ky house, Phuc Kien Pagoda, the former merchants’ houses, the 400 year-old Japanese Covered Bridge and the colourful riverside market. Excursion to My Son Holy land (35 km), once the spiritual capital of Champa Kingdom that dominated South East Asia for nearly a thousand years and occupied most of the central parts of Vietnam from 2nd century to 16th century with very rich in history and culture. Contemplate its remarkable red brick towers and sanctuaries dating from between the 7th and 13th centuries. Drive back to Hoi An, rest of the day is free to cycle through rice paddies to the nearby beach, shop for souvenirs among the antique shops and art galleries or just sit at sidewalk cafes and soak up the atmosphere of this friendly little town. Morning flight to Ho Chi Minh city, the biggest industrial and commercial center of Vietnam. We stroll around the downtown to explore the different local ways of life and visit the Reunification Palace, the Notre Dame Cathedral, the Old Saigon Post Office, the former Presidential Palace, the China town with Thien Hau pagoda and Binh Tay wholesale market. Journey to My Tho (65 km). Upon arrival we take a boat trip visiting the fish whalf, the 4 famous islands of Dragon, Unicorn, Turtle and Phoenix. Take a short tour by “xe loi” (motorized rickshaw) to the bank of Mekong River visiting a rice farm, candy workshop and honey bee farm, then journey by small sampan through the canals and mangrove forests where we watch the fishermen lay their fish traps. Enjoy time on the Unicorn island visiting the fruit orchards, taste diverse types of tropical fruits, tea mixed with bee’s honey. Experience a wonderful show of Mekong Delta’s traditional music and songs. Afternoon drive back to Ho Chi Minh city. Flight to Phnom Penh, the capital of Cambodia Kingdom. Despite its recent turbulent history, it still maintains considerable charm. A city tour acquaints us with some major sights of Phnom Penh. The private quarters of the Royal Palace are now home to the royal family and are therefore very close to the public. At the northern area of the palace grounds is Silver Pagoda, the most sacred shrine in the country. We visit both structures as well as the legendary temple of Wat Phnom, which provides an interesting view over the environs. The next stop of our trip is the National Museum, exclusively dedicated to Khmer art and sculpture. The majority of the exhibits are from the Angkor period from 9th to 15th centuries, but some date from as early as the 4th century. Early morning transfer to Phnom Penh port for departure to Siem Reap, down from Mekong River to Tonle Sap and it takes about 6 hours. Upon arrive at Siem Reap’s port you are met and transfer to the hotel. After short rest at your hotel we continue to visit the fabulous Ta Prohm embraced by the roots of enormous fig trees and gigantic creepers, Prasat Kravan – with its unique brick sculptures, Srah Srang – The Royal Baths” was once used for ritual bathing, Banteay Kdei (surrounded by four concentric walls). Evening enjoy Apsara Dance show. The tour continue with the visiting to the famous temple: Angkor Wat. Angkor Wat is a World Heritage Site since 1992, famous for its beauty and splendor. Angkor Wat features the longest continuous bas-relief in the world, which runs along the outer gallery walls and narrates stories from Hindu mythology, visit Bakheng Temple and enjoy a romantic sun set view form Bakheng hill. Leave Cambodia and fly to Vientiane – the capital of Laos, transfer to the hotel. Visiting this sleepy riveside capital city with the Great Sacred Stupa – That Luang, the beautiful Wat Phra Keow, the remarkable Wat Sisaket and the Arc de Triumph. We leave this wonderful town after breakfast for our journey northbound on route no. 13. We will see some breathtaking scenery enroute as we pass through spectacular countryside towards the mountainous region. 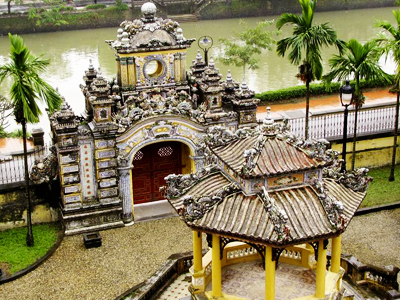 We make a stop along the way at Vang Xang, a famous archeological site dating back to the 11th century. We reach our final destination in the afternoon, the small and tranquil village of Vang Vieng, which is nestled on a bend of the Nam Song River. Its stunning scenery with a mixture of quiet water and limestone outcrops remains unspoiled, despite recent developments with the advent of tourism. On arrival at Vang Vieng, we cross the Nam Song River to Tham Jang caves and then enjoy a short trek through breathtaking mountain landscape to explore the Tam None Cave and some hill villages. Today ends with a superb panorama of the sunset reflecting over the Nam Song River. After breakfast, we start our board on a local tractor through paddy field areas heading to Tham Phoukham caves, where your breath will be taken away seeing the most beautiful and famous limestone cavern, surrounded by natural forests. Along the way, you have chance to explore the local cultures by greeting the local villagers and learning about their daily lifestyle. There is a small natural pool in front of the caves where you can take a swim to refresh yourself from the hot climate or you could explore the nearby area. You will have a picnic lunch enjoying the scenery. After spending the day at the caves and its surrounding areas, we make our return to the Vang Vieng town, using local transportation or tractor. En route, we visit the ethnic minority villages of Hmong, Souay and Taidam villages meeting the warm and friendly hill tribe people and observing their traditional tribal costumes. We have an early start for our expedition up route 13 north to Luang Prabang, Luang Prabang that is perhaps the best-preserved traditional city in Southeast Asia. The roads are well paved along the way for a smooth journey; we pass some stunning landscape scenery with a mixture of steep terraced fields and hill villages, we take a few photo stops at some small hill tribe village enroute. Each hill tribe village in Laos has a different feel, some are more prosperous than others but all have plenty of life. The Muang Xieng Nguen village is our next stop and we spend a short amount of time observing the local lifestyle prior to reaching Luang Prabang. Today, we enjoy a short-guided tour seeing the city’s oldest temple, Wat Sene and the magnificent Wat Xieng Thong where you can see the impressive “tree of life” mosaic pattern set in coloured glass. Its exterior architecture is remarkable with its roofs sweeping low to the ground, representing classical Laotian architecture. We then embark on a cruise upstream on the Mekong River, which also gives us a beautiful view of the tranquil countryside. We take an interesting visit to the mysterious Pak Ou Caves, two linked caves crammed with thousands of gold lacquered Buddha statues of various shapes and sizes left by pilgrims. Along the way, we stop at the village of Ban Xang Hai, famous for the production of Lao rice wine. On return to Luang Prabang, we take a short drive to Ban Phanom, a small village well known for its hand weaving. The National Museum (close Tuesday) at the former Royal Palace, which displays a lovely collection of the artefacts reflecting the richness of Lao culture dating from the days of the early kings right through the last sovereign, and the Central Market is not to be missed on this morning sightseeing tour. We bid farewell to this remarkable city and the trip ends after your transfer to the airport for departure. End of services. Note: Above price is not applicable for peak seasons (Christmas & New Year Eve; Vietnamese New Year) & other public holidays in Vietnam, Cambodia & Laos. * Discounts for family and more consistent groups. Please contact us. HERENOA TRAVELS SARL FXM au capital de 8.000 EUROS € 16 Boulevard Saint-Germain – CS 70514 – 75005 PARIS.